To see my 2015 Midsummer / Litha / Summer Solstice altar, click here! For all altars, click here! Midsummer celebrates the longest day of the year, focusing on the sun as a source of projective energy. As the longest day of the year, it's a time where we focus on working hard, seeing our goals become reality and bringing that which is in the shadow to light. This solstice is a day of courage and strength, a day where we examine our constitution and do away with that which does not serve us so that we can move forward towards our future, our hopes, our dreams. Because the sun is a key focus on this holiday, I chose to decorate my altar in hues of gold. Gold is a fiery color, representing strength, success and, of course, solar energy. I chose white as an accent color because it represents the clear light the sun projects, giving purity, protection, peace and life. Along the back of the altar, I placed five candles. You'll notice that they vary in size, ranging from a thin and gold to large and polka-doted. Each candle represents a time of day: Dawn, morning, afternoon, evening and dusk. You'll notice that night or midnight is not represented here. 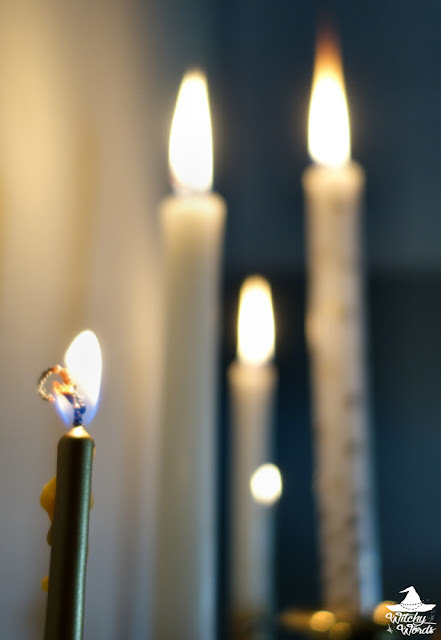 That's because these candles are lit ablaze with fire and colored in gold and white; in other words, these candles represent the sun itself and its travel across our sky. In front of the afternoon candle, representing the peak power of the sun, is an offering bowl filled with quartz pieces. Quartz is an amplifier, representing protection and purification. On top of the quartz are two golden flowers, representing summer life and abundance, as well as as a white feather tipped with gold paint and glitter. White feathers represent transformation, purity, peace and intelligence along with the element air. Two other offering bowls adorn the altar on either side, honoring the dawn and morning as well as the evening and dusk. These offering bowls are filled with white sand, something I find representative of the summer and the beach. In the sand, a feather, a flower and a tiger's eye are placed. Tiger's eye is a solar stone representing strength and protection. Because it's a stone also tied with the earth, it's a fantastic grounding stone. Midsummer is often closely tied to the Fae and what better way to honor them than to offer up fairy lights on the altar? That being said, these lights are contained, presenting the protective nature of the house. As much as I love fairies, they're mischievous little spirits. I'd much rather be able to find my keys tonight when I need them! You'll notice that all of the elements are properly represented on the altar: Fire for fire of course, but feathers for air, flowers and tiger's eye for earth and the fairies for water (I associate any spirit-like entity with the west, as that's where the veil is located in my frame of reference). 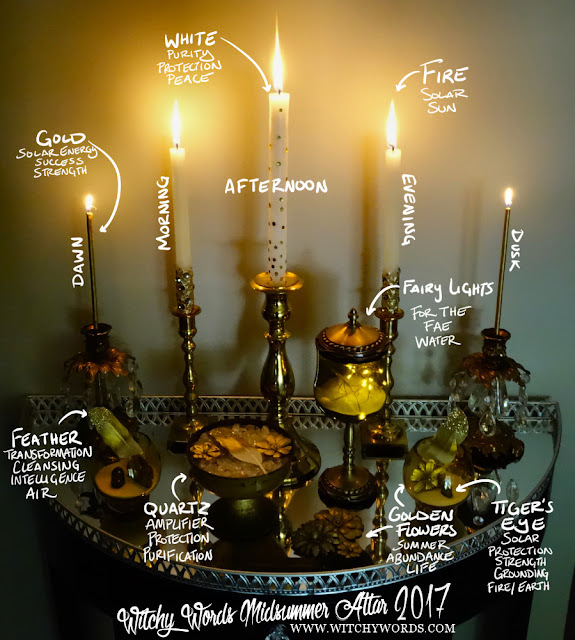 The altar itself is a beacon in the house, a glowing hub of gold welcoming the longest day of the year and the projective energy of the sun for success, growth and forward movement. Here's wishing everyone a fantastic Summer Solstice! I see you have a candle for dawn, dusk, etc. Did you light each one during the specific part of ghetto day or all at once? You areally definitely an Interior Designer Witch! Gorgeous! 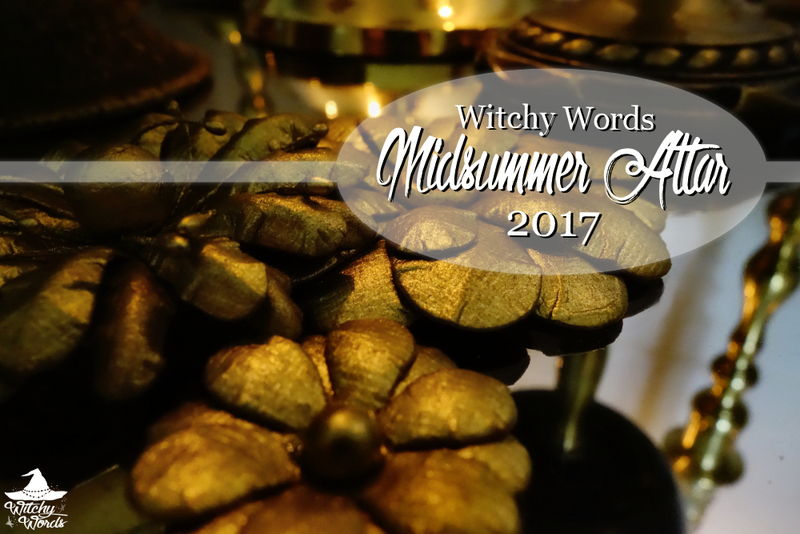 I did on Midsummer, which is why I posted this a day late - that way I could get a shot of all the candles lit! Thank you so much!